Staff Sgt. 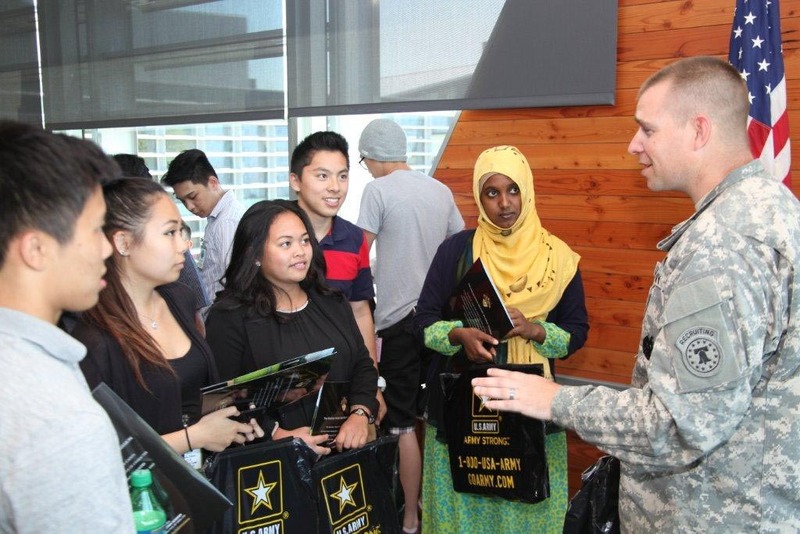 Curtis Tillinghast, Recruiting Company, talks to students from Cleveland High School students about the Army at the U.S. Army Corps of Engineers, Seattle District headquarters, June 9. The students attended a Corps of Engineers career fair where Tillinghast was available to talk with them. Lt. Col. Vylius Leskys, Seattle Battalion commander, interacts with a student from Cleveland High School during a career fair at the U.S. Army Corps of Engineers, Seattle District headquarters, June 9. A week-long career fair at the U.S. Army Corps of Engineers, Seattle District headquarters June 8-12, gave Seattle Battalion recruiters the opportunity to interact with students from Cleveland High School, which focuses on science, technology, engineering and math. Students toured the Hiram Chittenden Locks, job shadowed, engaged in mentoring sessions, and attended a career fair, where Seattle Battalion Commander Lt. Col. Vylius Leskys and Staff Sgt. Curtis Tillinghast offered insight about Army careers. Doris Cope, Corps of Engineer special emphasis team member, invited the recruiters to participate. Soldiers with STEM knowledge are critical to the success of U.S. military missions, which include contingency operations, warfighter support, civil works and humanitarian assistance.